(a) Place the brake booster accumulator in a vise and cover it with a cloth. 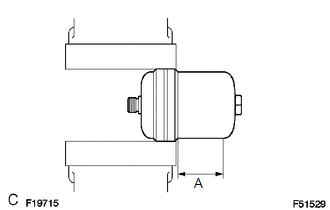 (b) Slowly cut a hole on the brake booster accumulator side in the A portion shown in the illustration on the left. And discharge the gas and liquid inside. As gas may spray out, cover the brake booster accumulator with a cloth when performing the operation. Work slowly and do not cut the hole too quickly or suddenly. Wear protective glasses during the operation. (c) When the outer body of the brake booster accumulator is cut, gas and liquid discharge. The gas is colorless, odorless and nonpoisonous nitrogen gas. The liquid is brake fluid.